Thought our birthday last year was extravagant? We’re back with our Fly Me To Korea contest, and this time it’s bigger, better and so much more fun! In collaboration with AirAsia Big, Oh My Oppa, and Starpass, we’re giving you and a friend the opportunity to live the Hallyu experience and discover Korea like a local with brand new eyes, including an Oppa tour, tickets to see The Show and even dine with the Althea Korea team! The Althea Fly Me To Korea ("Contest") is organised and run by Althea Korea. Althea Korea maintains this website www.althea.kr. You can access and partake in this contest only if you agree to and accept the following terms and conditions applying to your use ("Terms and Conditions") without limitation or reservation. Please read these Terms and Conditions carefully before accessing and partaking in this contest. You may not download material displayed on the Althea Website , Facebook and/or Instagram page for your non-commercial, personal use only. Additionally, you may not modify, reuse, report, or use the contents from this contest for public or commercial purposes, including the text, images, audio, and video without Althea Korea's written permission. Althea Korea reserves the right to cancel or amend the contest mentioned on the website or these Terms and Conditions at any time without prior notice. Any changes will be reflected in an updated and new Terms and Conditions. 1. The Contest is open only to persons who on the dates of entry are legal residents of the country residing in, who are at least eighteen (18) years of age. 2. 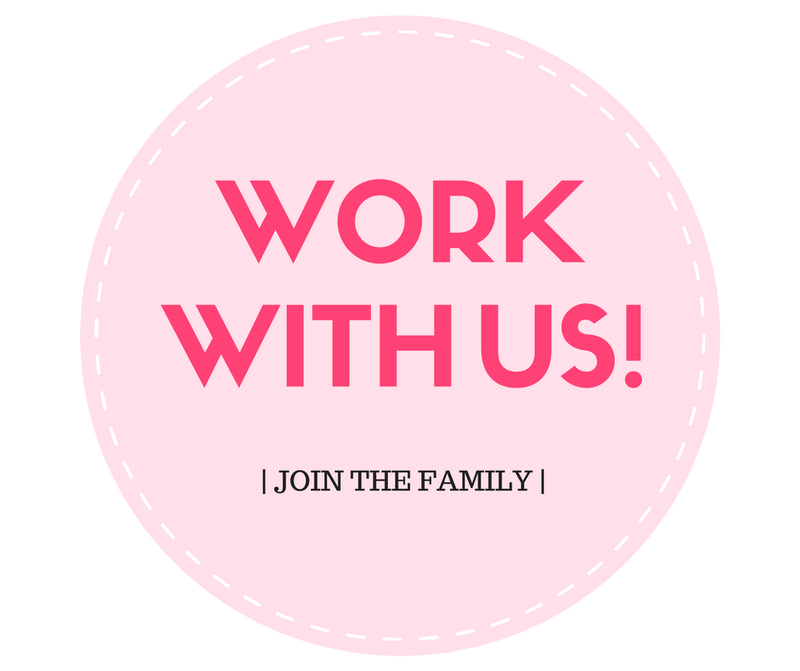 Employees of Althea Korea, their advertising and promotion agencies and their immediate family members and/or those living in the same household of each are not eligible. 3. Participants who purchase any products from Althea from 2nd July – 31st August 2018 are eligible to enter this contest and/or claim prize(s). LIMIT: Any attempt by any entrant to obtain more than the stated number of entries by using multiple/different Instagram accounts, identities, registrations and logins, or any other methods will void that entrant's entry and that entrant may be disqualified. Sponsor is not responsible for lost, late, incomplete, invalid, unintelligible or misdirected registrations, which will be disqualified. In the event of a dispute as to any registration or entry, the authorized account holder of the social media account used to register will be deemed to be the entrant. The "authorized account holder" of a social media account, is the natural person who registered for the profile. The potential winner may be required to show proof of being the authorized account holder, including but not limited to the proof issued by the social media platform. 4.Instagram account must be set to public during the Contest Period. 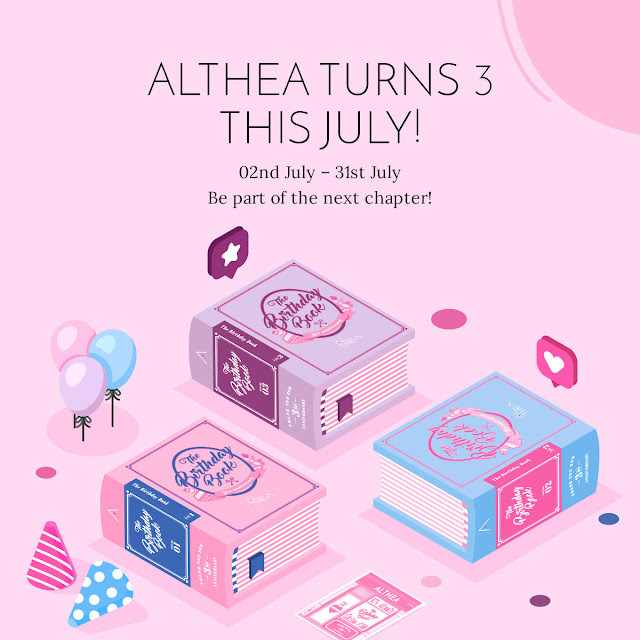 You must own one (1) post and share 1) a creative photo of all three (3) completed Althea Birthday Box miniatures 2) tag @altheakorea 3) use the hashtags #AltheaTurns3 and #AltheaKorea (all together, the “Entry”). 5. Althea Korea’s decision on all matters are final and binding. No correspondence will be entertained about Althea Korea’s decision. 6.Althea Korea reserves the right to disqualify all entries that do not meet the rules and regulations of the contest or to assign new winners in the event the original winners are unable or unwilling to fulfil the terms of this Contest. These include entries submitted with invalid or incorrect information. 1. Prizes are non-transferable and non-exchangeable for cash and may be subject to availability. 2. Winners and prizes are decided based on the creativity on their picture as well as caption of the post showcasing their Althea’s Birthday Book miniature creation. c. any tax liabilities in relation to the contest, prize and/or use or enjoyment of the same. 4. The winners of the contest will be announced on Althea Korea’s Facebook page. The winner will also be notified separately by email and will be required to acknowledge by return email by dateline mentioned. Althea Korea reserves the right to deal with all unclaimed prizes in any manner deemed fit. 6. The grand prize winner will be gifted with 200,000 Air Asia Big points for the purchase of the round trip tickets to Seoul, Korea on www.airasia.com. Points credited into the winner’s Air Asia Big Points account will be valid for only 90 days upon the date of winner announcement. The grand prize winner will also comply with all the terms and conditions of the use and redemption of Air Asia Big Points. Oh My Oppa tour, The Show tickets (only available on Tuesdays) and dinner with Althea team will be arranged. The grand prize awarded herein is subject to availability at the time of travel. 7.The second runner up prize winner of a unit of Samsung S9 will be given. The winner will comply with all the terms and conditions of the purchase and use of the Samsung S9. 8. The third runner up prize winner of Althea shopping credits worth USD$300.00 will be given to shop on www.althea.kr. The winner shall receive this in his or her Althea account of country of origin with the value at the prevailing currency exchange rate..
9. The ten (10) consolation winners of Althea Birthday Gift worth USD80 will have the prizes shipped to them. 10. The prize of Althea shopping credits are valid for 1 year from the day the points are awarded to the winner’s Althea account. 11. In the event that any entrant/winner is disqualified from the Contest, Althea Korea at its sole discretion may decide whether a replacement entrant/winner should be selected. In this event, any further entrant/winner will be selected on the same criteria as the original entrant and will be subject to these Terms and Conditions. 12. Where applicable, prizes not collected by deadline mentioned shall be disposed of at Althea Korea's sole discretion. Althea Korea's decision regarding the award of all prizes, and/or in every situation including any not covered in these Terms and Conditions, shall be final and binding on all participants in the contest, and no queries, challenges or appeals may be made or entertained regarding Althea Korea's decision on the same. The receipt by any winner of any prize under this Contest is conditional upon compliance with any and all applicable laws, rules and regulations. 1. 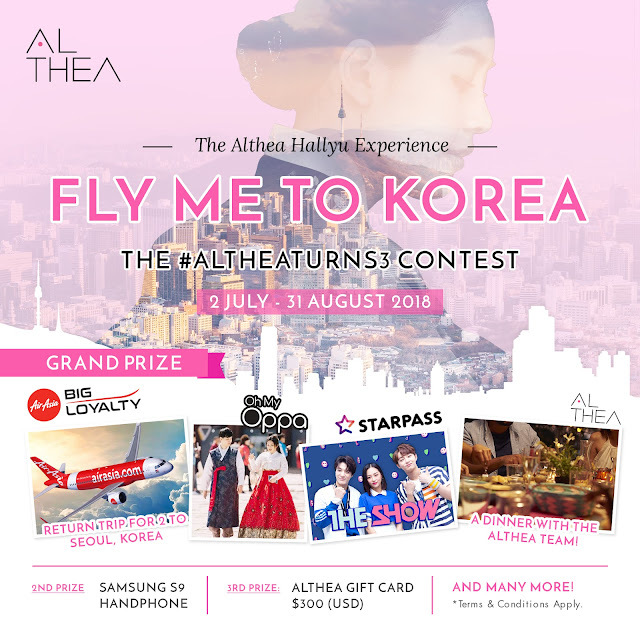 Althea Korea cannot accept any responsibility for any damage, loss, injury or disappointment suffered by any entrant entering the Contest or as a result of entering the Contest or accepting any prize. Althea Korea is not responsible for any safe custody, return, non-delivery or missing of entries, late, misdirected, problems or technical malfunction of any telephone network or lines, computer on-line systems, servers, or providers, computer equipment, software failure of any email or entry to be received on account of technical problems or traffic congestion on the Internet, telephone lines or at any web site, or any combination thereof, including any injury or damage to entrant's or any other person's computer or mobile telephone related to or resulting from participation or downloading any materials in the Contest. 2. By entering the Contest or accepting the prizes, participants agree that no claim relating to such losses or injuries (including special, indirect and consequential losses) shall be asserted against Althea Korea, affiliates, directors, officers, employees or agents from any and all losses, damages, rights, claims and actions of any kind resulting from the Contest and acceptance of any prize, including without limitation, personal injuries, death and property damage. 1. By entering the contest, participants agree to the use of their name and/or likeness, without compensation, for Althea Korea's promotional and marketing purposes. b. she/he is authorised to disclose such Personal Information; such disclosure complies with any Privacy Legislation from any country, within the geographical scope of this competition, and the use of such Personal Information by Althea Korea as contemplated by this Contest including, without limitation, the disclosure of such Personal Information to Althea Korea's external agencies or third parties. Wish I can win the prize. Cant resist this great opportunity. i did my first shopping and i bought a lot... hopefully i can get the BIRTHDAY BOOK and WIN the trip to Korea! !